Remember that classic Christmas ditty with the kid that sang about how she couldn’t whistle, because she had lost her two front teeth? That song always comes to mind when December rolls around, when everyone from advertisers to little children are talking about writing a list of what we want. I remember, as a child, the excitement of the arrival of the Sears Wish Book. My brothers and I would circle, star and check mark the sugar plums that would be dancing in our heads until Christmas morning. I remember, as a teen and young woman, eager for that special gift from that special guy. I remember, as a newly wed, eager to see how well my new hubby had studied my heart (and that story is a classic that continues on each and every Christmas). I do not remember when things changed, but they did, and they have changed. If I had a wish list, there would be not one ‘thing’ on it. Oh, it would be a list, but not one thing could be wrapped with shiny paper and a bow. This list would be strikingly similar to my prayers. It would include health for those who are ill, peace for those who live among conflict, love for the lonely, homes for the homeless, food for the hungry, and light for those living in darkness. 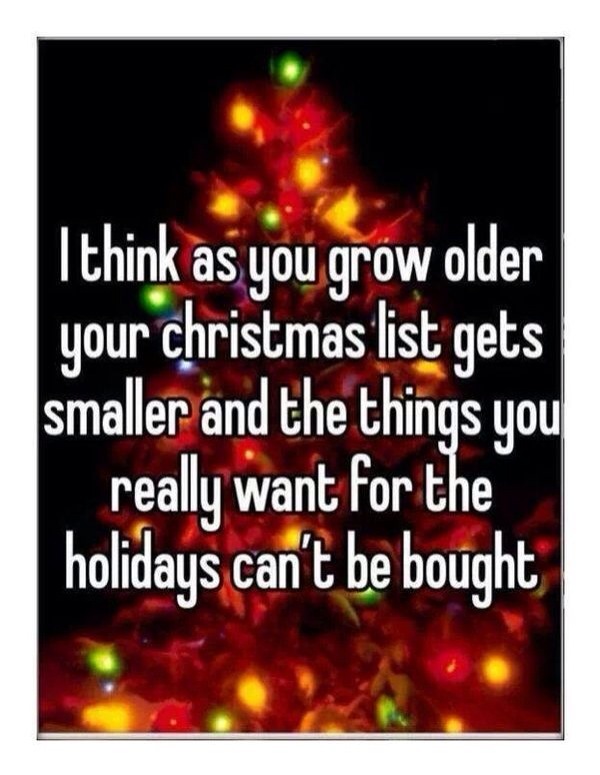 This list would also be about loved ones, near and far, memories of Christmases past, hopes for the future. It would include joy for our kids, new memories made, and rest for their parents.